Our Shea BUTTER - Nothing Added; just plain Organic, Pure and Unrefined! The fatty acids in Shea Butter helps renew skin cells. Sun Damage ProtectionShea Butter has natural sunscreen properties. The sun protection factor is about 6, having the additional protection that Shea Butter provides is a bonus. includes Vitamin A for healing and Vitamin D to promote skin cell growth. essential fatty acids improve skin elasticity. Shea Butter - nature's gift to promote healthy, radiant skin. Note : if you have a serious skin condition, you should see a doctor. 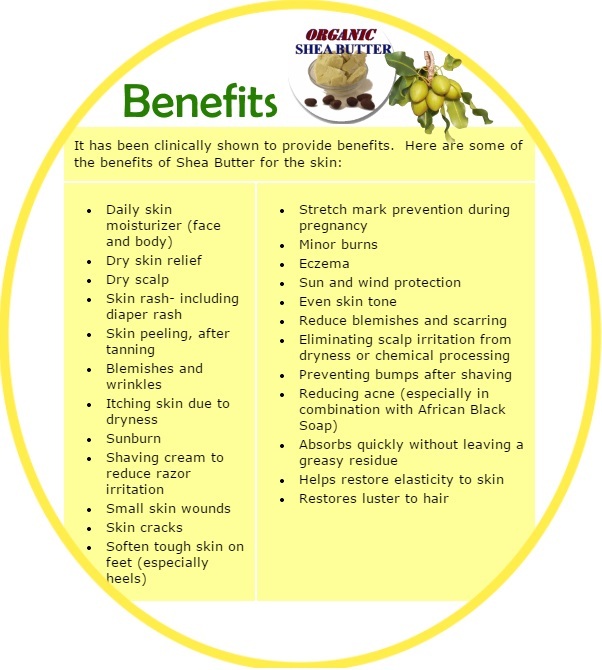 Benefits of Shea Butter ... settle for Organic grade!